Where Can You Find Archery Answers? What are the different types of bows, and how many pounds of pull you need? And what about the arrows? How long? Made of carbon or wood? Don't make the hundred-dollar-mistake of ordering the wrong length of custom arrows like I did. Whether you buy your equipment from a sporting goods store, archery store, or online, the sales people will ask you: What is your draw length? BEFORE you start talking to sales people and shopping online for the best deals, I think you'll want all the bases covered. That's why I wrote Archery Answers, a book in clear, no-nonsense language to teach you all the stuff you need to know and that you can apply immediately. I wrote this book to share with you all I've learned. From personal experience I found that we don't want more confusing information, we only need the right information, the facts that really matter. Now fast forward a couple of months. You are an archer, yes a beginner, but you have confidence. Think of the conversations with your family and friends. You'll be gushing to share your love of archery, and they will want to hear about you and how you are progressing. Besides buying the correct gear in the first place, do you want to save even more money by making your own accessories? Yes, you can really make your own finger tab, bow stringer, armguard! Of course you can, and of better quality than the store-bought ones. WARNING! After a day of shooting, some arrows could get damaged. (I know from personal experience-it's inevitable.) How do you repair an arrow if you lose the metal point in a log? How do your re-cement that feather perfectly when that fletch falls off? Archery Answers teaches you these critical bits of know-how and much more. Included are many techniques, explanations, and instructions, all geared to the beginner. Archery Answers is loaded with over two hundred pictures. FACT: "Students are more likely to remember information that is learned with a visual aid." Beeland, W. "Student Engagement, Visual Learning, and Technology: Can Interactive Whiteboards Help?" (2001). FACT: The Question and Answer format helps students remember more easily: "
it requires students to retrieve information from memory, and such effortful retrieval turns out to be a wonderfully powerful mnemonic device in many circumstances." Benefits of testing memory: Best practices and boundary conditions. Roediger III, Henry L.; Agarwal, Pooja K.; Kang, Sean H. K.; Marsh, Elizabeth J. Davies, Graham M. (Ed); Wright, Daniel B. (Ed), (2010). FACT: "Words are abstract and rather difficult for the brain to retain, whereas visuals are concrete and, as such, more easily remembered." Archery Answers is structured in a question and answer format to help you learn in a quick and easy manner. Whether you buy the paperback version or the Kindle book, you will find that learning is fun because of this conversational approach. Now you can hear Alexa read exerpts from the book on your Echo device! Click the logo! Or just search for Archery Answers in your Alexa phone app. Here is a 200 page book that you are going to refer to again and again, whether you are setting up your bow for the first time, adding nocks to your bow string, fixing arrows, or maybe wanting to make another finger-tab out of a scrap piece of leather. "I'm new to archery, just got my first bow, and I was nervous about setting it up and using it. I'm glad I found this book which walked be through the basics of stringing the bow and twisting down the length of string so I had the correct brace height. For someone just getting into this hobby, I recommend this book. I made my own arrow measuring tool also." 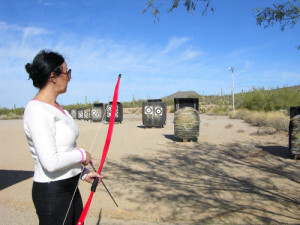 "I am one of the three archery instructors in our local park program. Although this book is not in the format of a detailed course manual, which is what I learned from, I think it would be very helpful to beginners, especially people who never picked up a bow before. As much as I enjoy teaching newbies, adults and kids alike, I imagine that if people came to my beginner's class having read this book, they would feel more comfortable at their first lesson. If you were completely new to archery I could recommend this book." "What a nice beginner book on Archery. I just bought it and my granddaughter (16) is already going through it and asking questions, and making a list of what she wants Mee Maw to buy for her. Definitely a good book for a wholesome hobby." The paperback is priced at $8.18 (the lowest Amazon will allow for a paperback with over 200 black and white pictures). The Kindle version with color photos is FREE when you buy the paperback (normally priced at $2.99 for the Kindle version on Amazon. NOTE: If you have Kindle Unlimited, then you can simply read the book for FREE at any time. NEW: Smashwords just published it for $1.99. Smashwords distributes to the Apple iBookstore, Sony, Kobo, B&N, Aldiko, and others. Thanks for reading this, and good luck in Archery. 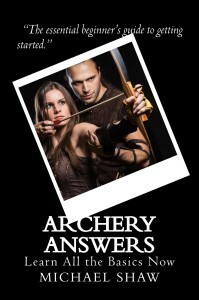 Now you have the way to get the Archery Answers you have been looking for. So get out there and Shoot some arrows!